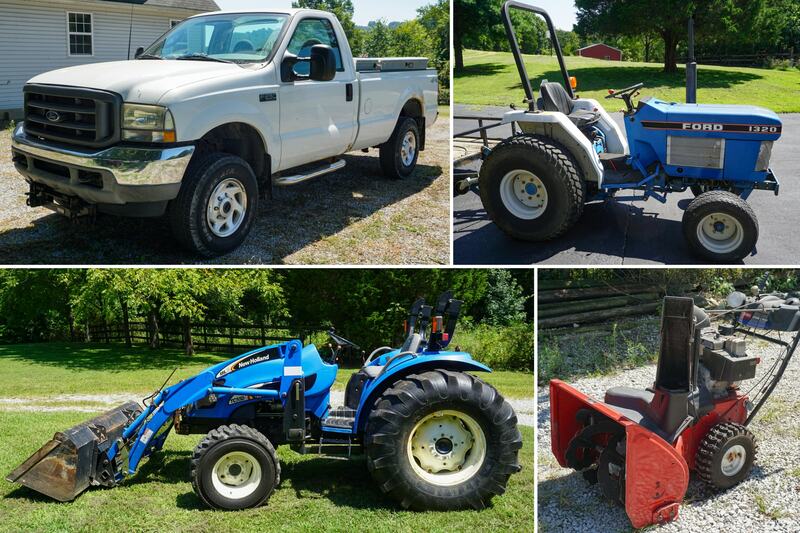 Tractors, Vehicle & Furniture Auction — Harritt Group, Inc.
7% Indiana sales tax collected on titled vehicles. Selling live onsite for Chris & Annette Chafin and her late husband John Zurschmiede Jr. a New Holland tractor w/front loader, Ford 1320 compact tractor, Ford F250 snow plow truck, utility trailer, lawn & farm equipment, tools, building supplies,1864 barn lumber, appliances, furniture & household. Located 4 miles North of I-265 and 2.5 miles South of IN-60. Plenty of parking! 2005 New Holland TC55DA 4WD 55hp shuttle shift diesel tractor w/18LA front loader, 813 hours, Serial No. HX12175 & 1992 Ford 1320 diesel 2WD 20hp compact tractor w/turf tires, 895 hours, Tractor No. UE26447. 2003 Ford F250 XL Super Duty 4WD 5.4L triton V8 single cab pickup truck w/Western snow plow, nearly-new aluminum diamond point tool boxes, 133K miles. 6’x10′ single axle flatbed utility trailer, County Line 3pt rotary mower, 3pt grader box, 3pt drag, gas-powered John Deere MC542 Material Collection System lawn vacuum on 17p cart, lawn aerator, Toro 828 LXE gas powered snow blower, gas powered MTD Yard Machine snowblower, pull type electric lawn sprayer, salamander heater, bench grinder, Hi-Lift farm jack, lawn roller and more. Craftsman table saw, Felker tile master cutter, Rockwell sander, Dremel scroll saw, yard hand & power tools, selection of unused pre-hung doors, windows & assorted building supplies, wheelbarrow, creeper, jumper cables, loading ramps, floor jack & stands, drywall stilts, step & extension ladders, lumber, selection of wood from 1864 barn, critter cages, & miscellaneous contents of garage. Black Amana side-by-side refrigerator & black Whirlpool flat top electric range. Ultra SUN Professional magnum power tanning bed. (2) 1940’s Federal style mahogany china cabinets, antique oak high back bed & serpentine dresser, cherry china cabinet, (2) cherry pedestal dining tables, (8) highly carved Chippendale style dining chairs w/striped cushions, 5-piece rustic pine bedroom suite, (6) maple windsor style dining chairs, handmade grandfather clock, cherry Queen Anne huntboard server, cherry console table, full size bed, white bedroom furniture, (4) wrought iron bar stools, pair of wrought iron stand tables, iron magazine table, contemporary dining table & chairs, settee storage bench, velour loveseat, antique lamp tables, vintage school desk, round oak pedestal table & chairs, decorative tri fold wood room divider, spindle back rocker, iron bakers rack, flame upholstered loveseat, office chairs & cabinets, oak & metal desk, stand tables, wood IU coat rack, decorative metal Knight, 4-quart butter churn, prints, small digital safe, (2) deer mounts, vintage golf clubs, paper shredder, receiver hitch bicycle rack, Men’s Schwinn Clear Creek mountain bike, iron & wicker patio bar, (5) patio chairs and more common household items. I-265 to IN-111 Grant Line Road Exit#3. North 4 miles to property on right. Or 2.5 miles South of IN-60.